BLACKWATERS launch into 2017 with a ripe slice of high-octane indie in the shape of new single: ‘Down’. The latest release from these tempestuous teen upstarts arrives at the peak of their first nationwide live dates – a co-headline tour with like-minded Blackpool rockers Strange Bones. Swiftly following their Radio1 and Radio X hailed debut outing, anti-anthem ‘So Far Out’; the Surrey-based hell raisers released ‘Down’ on 3rd of February 2017 via the Scrubs record label. BlackWaters are four immense – loud – eighteen-year-old indie thrashers from the UK.Having scored fans and co-collaborators in the likes of Carl Barât (The Libertines), Spike Stent and sometime Prodigy co-writer Olly Burden, the four-piecehave evidently been making the right kind of racket. 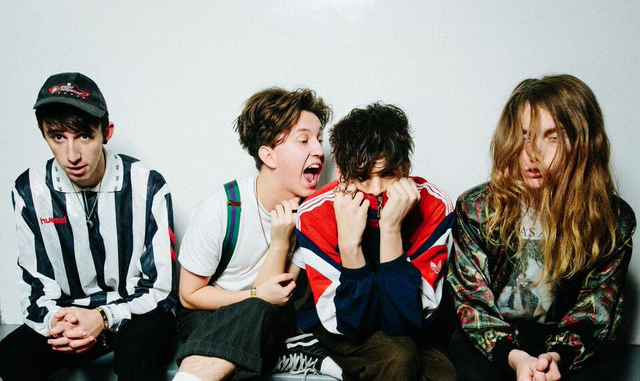 Performing on the BBC Introducing Stage at Leeds Festival & supporting the likes of SWMRS & DMAs last year, the band look to make 2017 theirs as they release new single ‘Down’ and embark on a nationwide co-headline tour with Strange Bones.